Someday My Favorite: Harvest Time. 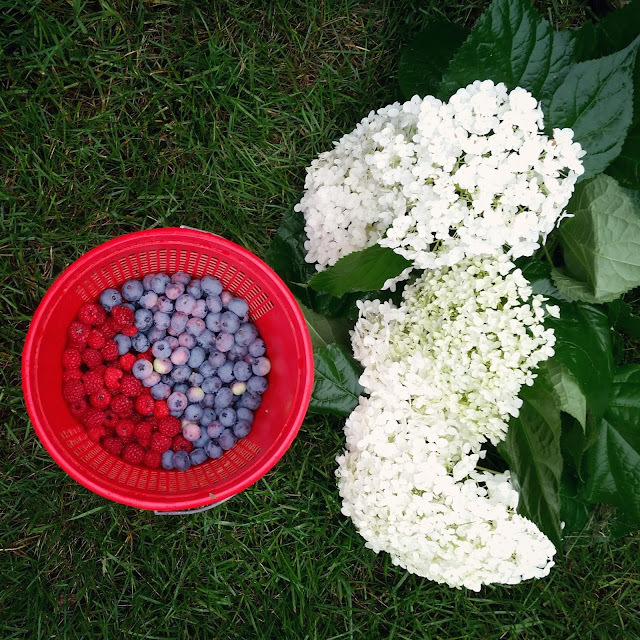 This afternoon, I found myself picking raspberries and blueberries in the pouring rain. Perhaps it was the light rains' tune as it bounced off of our new barn roof, or the simple peace that comes in those rare moments of quiet, but I became overwhelming aware of time. As I pulled each berry, I couldn't help, but to be inundated with thoughts about how many things had to go right. The right amount of sun, the right amount of rain, the lack of varmints, and the attention during the short harvest window. Often, I find myself tempted to harvest prematurely. I want to don my proverbial garden gloves and pluck and pull. But the fruit, oh the fruit, it simply isn't ready. It is a bit sour and a bit crunchy and far, far from perfect. When we wait, though. Gosh, it is beautiful. Succulent is a strange word, but the only one that seems to do these justice. This harvest became toppings for ice cream sundaes with old friends 'round our little table in our little farmhouse tonight. And our hearts overflow. We are asked to wait. The fruit, though. Oh, the fruit!